The vintage pen here is the 1950 Centropen/Rippet Barclay 1304/809 in a #4 size Vac-fill, in 835 Coin Silver with alternating wave-chased and Barley panels. CP clip. This is a high-quality pen made in Czechoslovakia, with Czech. control marks on cap and barrel. Removing the blind cap reveals a hollow clear acrylic plunger which is pressed several times to fill the pen. The hollow plunger also actually fills with ink, allowing the user to monitor the ink level in the pen. Alloy nib signed “Centropen Iridium 42″ (medium). Near mint, and quite rare. 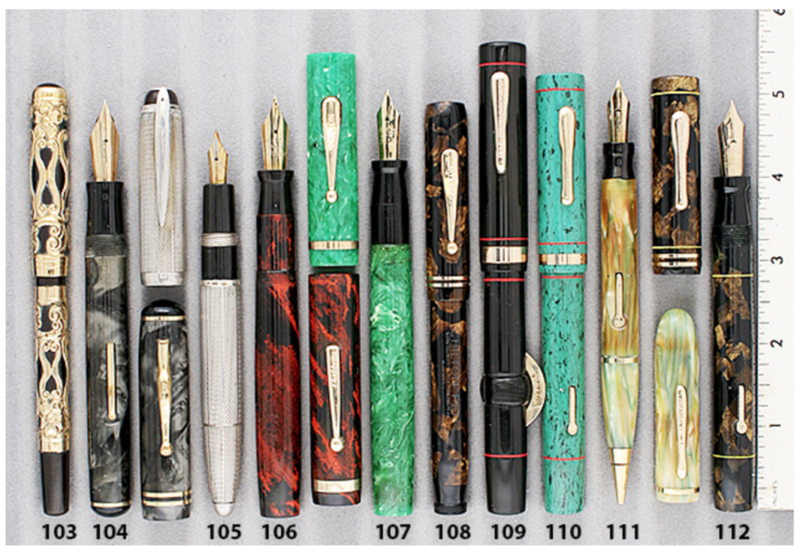 This entry was posted in Vintage Pens and tagged Catalog, Catalogs, CentroPen, Extraordinary Pens, Fountain Pens, Go Pens, GoPens, Nibs, Vintage Fountain Pen, Vintage Fountain Pens, Vintage Pen, Vintage Pens. Bookmark the permalink. Follow any comments here with the RSS feed for this post. Post a comment or leave a trackback: Trackback URL.